Testarossa is committed to the sustainability of the land and the vineyards that produce the grapes for our acclaimed wine. We only contract with the most professional growers within the state’s top appellations for world-class Chardonnay and Pinot Noir. They share our vision and are committed to close collaboration to keep the wine, grapevine and earth in harmony. A Holistic View—pursuing our terroir goal. Our ultimate terroir goal is to have the simplest building blocks from which to create our wine. We want the freshest product that is the most genuine in nature. Ours is a holistic, long-range view toward winemaking, instilled by the vineyard and winemaking knowledge of our Director of Winemaking. A farmer himself, Bill Brosseau views wine-making like liquid architecture. 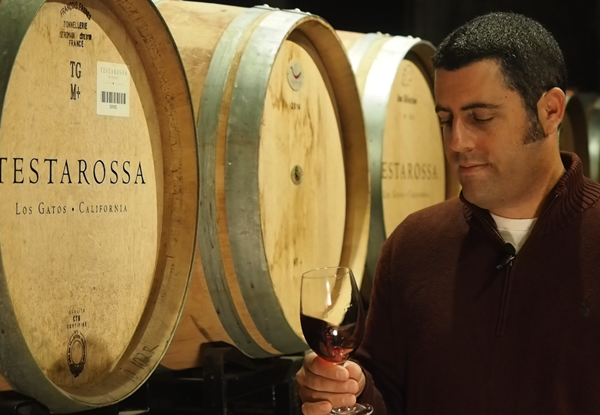 “I design the wine in the vineyard, so we don’t have to synthesize it in the cellar.” It’s this approach, and our commitment to consumer health, that makes sustainability a priority at Testarossa. We work with over 20 of the top vineyards in Monterey and Santa Barbara County. They represent the full range of farming endeavors: from Sustainability in Practice (SIP) certified, to certified organically farmed, to those with no certifications but who are aligned with our terroir goal. Regardless of certification, we try to challenge all of our growers to “do less.” Whether that’s in pest, water or soil management, we challenge them to rely on the least amount of synthetic products to render the most genuine wine. Our goal is to have zero residue of any vineyard products. We simply don’t want chemical interference in our winemaking. Because SIP doesn’t specifically monitor that, in some respects, we drive our growers toward standards that go beyond formal sustainability certification. Pest management practices – integrating cultural or biological practices that discourage insects. Fertilization practices – urging constant restraint to extend the life of their vineyard. Weed control practices – choosing specific agents vs. broad-spectrum products; “surgical farming” complements surgical winemaking. Our long-range view on sustainable farming decisions is to have the wine and grapevine in harmony. We have to manage that balance to achieve consistency year to year. The least amount of ingredients used renders the most consistent wines. Achieving that balance through sustainable practices is not only the right thing to do, it’s the key to our ongoing success. We use 100% food-grade oils and lubricants in our production facility. Our cleaning agents are steam and plant-oil based, safe for the waste stream. Our low-flow barrel washers conserve water. We recycle all metal, paper and plastic products on premises. Our restrained winemaking practices use minimal outside ingredients. The few additives we use are non-GMO, organic and kosher, when possible. All barrels are repurposed after winemaking use.